How do you attract tourists when, let’s be honest, your home state’s just a bit boring? That was the dilemma facing US midwestern town Nebraska which, due to a lack of things to do, was facing a visitor shortage on top of being voted the “least likely state” tourists planned on visiting. 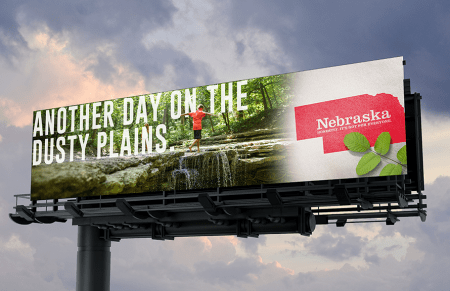 Hence, its new tourist catchphrase, “Honestly, it’s not for everyone” which aims to lure tourists from noisy cities to enjoy Nebraska’s peace and quiet. 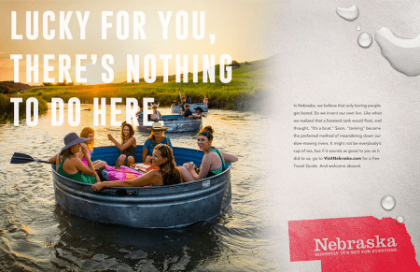 The new campaign’s the work of local creative agency Vladimir Jones and even includes the line “Lucky for you, there’s nothing to do here” in one of the print campaigns. 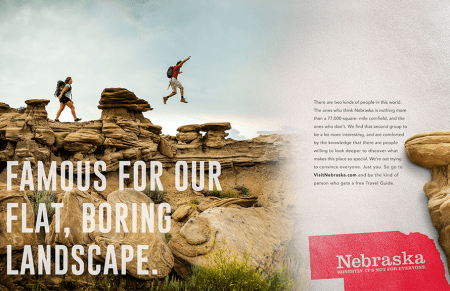 Nebraska’s state tourism director John Ricks said that due to Nebraska’s reputation for being dull the marketing campaign needed to be different. Haha I will atest to that fact having lived there for 4 years, however, it is a reasonable friendly place and the some of the nicest people we met in the USA. This new ad marks the brand’s first major global campaign since 2011, and a word of warning: it’s extremely cute. Rhys Darby and Jacinda Ardern are back at it again, trying to solve the mystery of why New Zealand keeps getting left off world maps. Prepare for an influx of bookings, folks, ’cause this one is expected to reach a whopping 1.97 million consumers!